Artificial silk or art silk is any synthetic fiber which resembles silk, but typically costs less to produce. Frequently, "artificial silk" is just a synonym for rayon. When made out of bamboo viscose it is also sometimes called bamboo silk. The first successful artificial silks were developed in the 1890s of cellulose fiber and marketed as art silk or viscose, a trade name for a specific manufacturer. In 1924, the name of the fiber was officially changed in the U.S. to rayon, although the term viscose continued to be used in Europe. The material is commonly referred to in the industry as viscose rayon. Although not sold under the name art silk initially, nylon, the first synthetic fiber, was developed in the United States in the late 1930s and used as a replacement for Japanese silk during World War II. Its properties are far superior to rayon and silk when wet, and so it was used for many military applications, such as parachutes. Although nylon is not a good substitute for silk fabric in appearance, it is a successful functional alternative. DuPont's original plans for nylon to become a cheaper and superior replacement for silk stockings were soon realized, then redirected for military use just two years later during World War II. Nylon became a prominent industrial fiber in a short time frame, permanently replacing silk in many applications. In the present day, imitation silk may be made with rayon, mercerized cotton, polyester, a blend of these materials, or a blend of rayon and silk. Despite a generally similar appearance, genuine silk has unique features that are distinguishable from artificial silk. However, in some cases art silk can be passed off as real silk to unwary buyers. A number of tests are available to determine a fabric's basic fiber makeup, some of which can be performed prior to purchasing a fabric whose composition is questionable. Tests include rubbing the pile in the hand, burning a small piece of the fringe to smell the ash and smell the smoke, and dissolving the pile by performing a chemical test. "Banglori silk" is actually polyester woven to appear like silk. ^ a b "Is Your Silk Oriental Rug Made of Real Silk?". Jacobsen rugs. Archived from the original on June 14, 2002. Retrieved 2012-05-23. ^ Stefan Anitei (April 18, 2008). "Bamboo Silk could be the Textile of the Future". Softpedia. Retrieved October 14, 2014. ^ "A Short History of Manufactured Fibers". Archived from the original on 11 May 2008. Retrieved 2008-06-11. ^ "Ohio State University Extension Fact Sheet: Rayon—The Multifaceted Fiber". Archived from the original on September 17, 2002. Retrieved 2008-06-11. 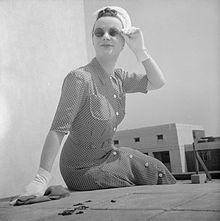 ^ See DuPont's Press release on Nylon in 1938 which claimed nylon was "strong as steel" and the "first man-made organic textile prepared from raw materials of the mineral kingdom." ^ "Nylon Sellout," Newsweek, May 27, 1940, pp. 65-66. ^ "Stocking Panic," Business Week, August 9, 1941. ^ "Hosiery Woes," Business Week, February 7, 1942. ^ "Types of oriental rugs, Glossary - weaving, materials, dyes, design". bukhara-carpets.com. Retrieved 23 May 2015. ^ "Wayfair.com - Online Home Store for Furniture, Decor, Outdoors & More - Wayfair". csnrugs.com. Retrieved 23 May 2015. Is Your Silk Oriental Rug Made of Real Silk? See The Stocking Story: You Be the Historian at the Smithsonian website. This page was last edited on 20 June 2017, at 06:30 (UTC).